"Suddenly Aragorn leapt to his feet. 'How the wind howls!' he cried. 'It is howling with wolf-voices. The Wargs have come west of the Mountains!'" You’ve taken your first steps into Middle-earth, but the road beckons once more. Dark machinations are unfolding across the Shire and heroes are once again needed to step forward and fight this menace. It's time to set off on a new adventure. Pre-order your own copy of the Villains of Eriador Figure Pack at your local retailer or online through our website with free shipping in the continental US today! 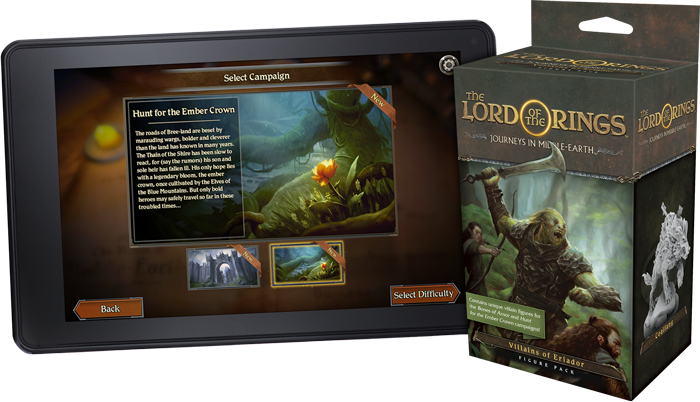 Hunt for the Ember Crown is the first downloadable campaign available for purchase on the Journeys in Middle-earth companion app, offering a completely new set of quests and challenges that can be played using the contents of the Core Set. Featuring eleven new adventures and a deeply branching narrative that could lead you from the roads of Bree-land to the slopes of the Blue Mountains and beyond, this campaign presents fresh challenges to test even the strongest Fellowship. Those that choose to accept the challenge of the Hunt for the Ember Crown or the Bones of Arnor campaign from the Journeys in Middle-earth Core Set can further enhance their experience with the Villains of Eriador Figure Pack. 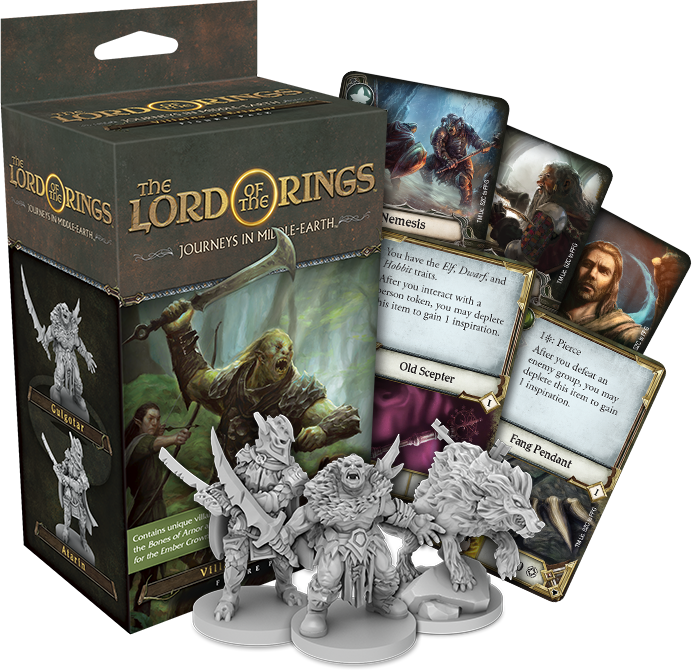 Containing three beautifully detailed miniatures that bring Eriador’s most vicious enemies to life, as well as new title and trinket cards, this pack is the perfect place to start growing your Journeys in Middle-earth collection. Something is not right in Bree-land. The roads are beset by maruading Wargs, bolder and cleverer than the land has known in many years. The Thain of the Shire, responsible for protecting its people, is the first to notice these skirmishes are not as random as they first appear. But he has become withdrawn and distracted as of late, offering only token measures to protect the Shire and its people. Some say his son has fallen ill and his only hope is a legendary bloom, once believed to be cultivated by the Elves of the Blue Mountains. In Hunt for the Ember Crown, the Thain has beseeched you to seek out this flower. But such a journey is fraught with peril, and you'll ultimately choose the path your Fellowship takes. Perhaps you decide to cross the haunted Barrow-downs in search of answers. 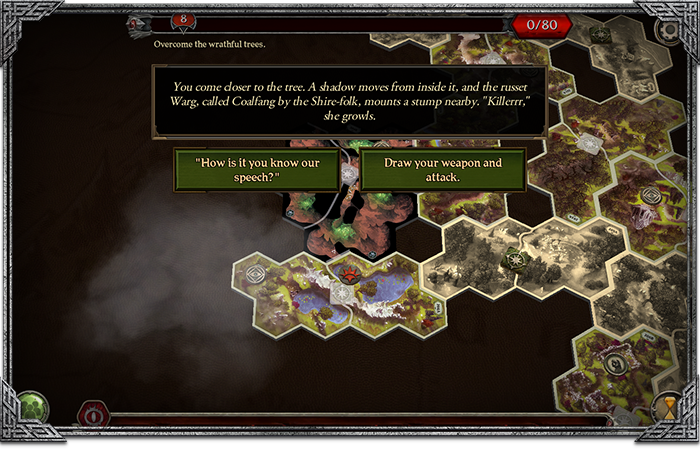 Or, you could choose to travel through the Old Forest—straight into a confrontation with Old Man Willow. No matter your road, you're sure to be hounded by the Warg Coalfang, who seeks vengeance for her slain packmates. Time is short. Can you find the Ember Crown and return to the Shire in time to save the Thain's son? Whether you seek the Ember Crown or you're investigating a rash of thefts across Eriador in Bones of Arnor, you can bring the dastardly villains you face in these campaigns to life with the Villains of Eriador Figure Pack. This Figure Pack expands your games of Journeys in Middle-earth by providing unique plastic figures presenting three particularly powerful villains you could encounter during your adventures. Within this pack, you'll recognize the power of Gulgotar, Atarin, and Coalfang as soon as they appear. But you don't have to face these villains unprepared. This Figure Pack also contains six new trinket cards and three new title cards, giving you new ways to deal with any enemies you come across. 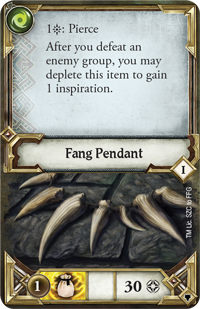 When equipped with a Fang Pendant, for example, you can add Pierce to any attack that uses your agility. 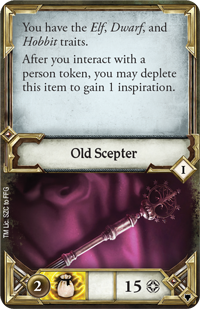 Similarly, you could find an Old Scepter that gives you an air of authority, helping you more easily interact with the denizens of Middle-earth. 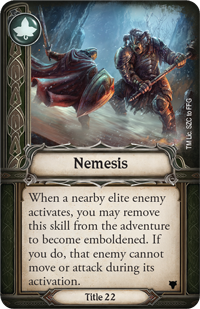 The elite enemies you find in this pack are sure to nip at your heels and stall your progress, but if you stand your ground, you could be named their Nemesis and gain a crucial advantage in future encounters. The road goes ever on, and no journey is ever truly complete. Gather your fellowship and prepare for new adventures in Middle-earth! 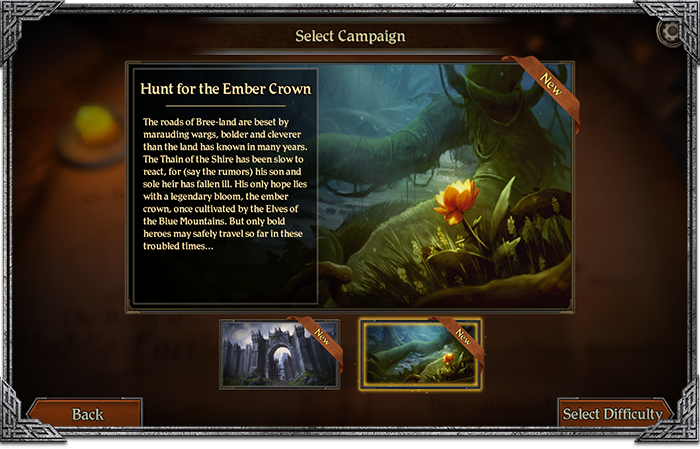 Look for the Hunt for the Ember Crown campaign on the App Store, Google Play, Amazon, and Steam in the third quarter of 2019. The Villains of Eriador Figure Pack (JME04) will arrive at your local retailer in the third quarter of 2019. Pre-order your copy at your local retailer or online through our website—with free shipping in the continental US—today! The Lord of the Rings: Journeys in Middle-earth is a cooperative board game of thrilling adventure and heroism in J.R.R. Tolkien's Middle-earth. Over the course of a stunning campaign, you and your fellow heroes will forge your own Fellowship, playing as some of the most iconic heroes from The Lord of the Rings and embarking on your own adventures. With the help of a companion app to guide the narrative and control the forces of Sauron, you're ready to start a journey like no other!